The tomato seedlings are looking great. Some of them are getting quite tall in fact, so tall that they might need some support before long. If your tomatoes are getting very tall and thin, you can support them with disposable bamboo chopsticks. Stick the chopstick into the soil 2 or 3 cm from the base of the plant, being careful not to damage the roots. Gently and loosely tie the tomato to the stake, perhaps with a wire twist tie. This will make your tomatoes less likely to break, especially when you bring them back to school. The tomatoes I took home have only needed watering once so far. When you do water, don't add too much. The soil shouldn't become too water-logged. I hope everyone is having a great break! Our tomato seedlings are doing well. The true leaves are forming and they look healthy. They even survived 5 days by themselves at school. However, they won't survive over the spring break without some help. That's where you come in. These plants need a home over spring break. They need someone to watch over them, to water them when needed. Remember, if we take good care of these baby plants, they might grow as tall as you, or perhaps taller, and each plant could yield 20 to 30 pounds or more of tomatoes! 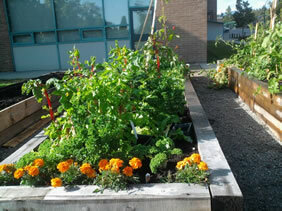 We have 25 seedlings, but we will probably plant 15 in our garden. Location: Tomatoes love bright light. 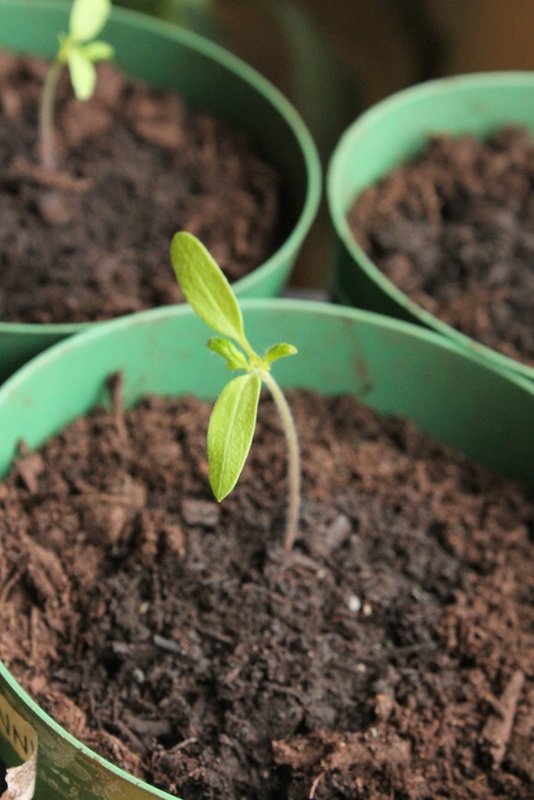 Keep the seedlings inside, with exposure to direct sunlight. The best location would be a south facing window with a clear view of the sun. Watering: Don't overwater. Don't underwater. Place the pots in a tray or deep plastic dish (which we will supply) and water them from below (put the water in the tray and let it soak upwards). You can tell a plant needs water by lifting the pot and feeling its weight. Also, tomatoes don't like to be wet all the time, so let them dry out a bit between waterings...not too much, but enough to stop the mould from growing. You will probably only have to water them every few days. Finally, try not to get the leaves wet. Pot Rotation: If you leave the pot alone, the tomato will grow towards the light, which means it will grow sideways at an angle. We want our tomatoes to grow upright, so once a day, we turn the pots around so the leaves are pointing away from the sun. Then the leaves will move, pointing the other way back towards the Sun. Don't touch or push the plant around as that will stress it. 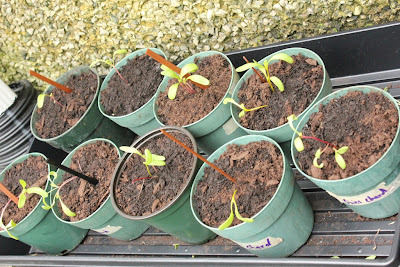 Staking: You probably won't have to do this, since the tomatoes probably won't grow big enough over spring break, but later we might have to use disposable chopsticks to prop up the plants up, so they don't fall over. Watch, Learn, and Enjoy: Tomato plants grow quickly, and you will be able to see the growth day by day. Imagine these little tiny plants becoming big, and eventually giving you tomatoes you can eat. There is something magical in that. The tomato seedlings seem to be doing fine. The stems seem to be reasonably thick, and the true leaves are appearing. I think they are reasonably healthy. As they get bigger, we will have to tie them to small stakes so they won't collapse. We might use disposable chopsticks. 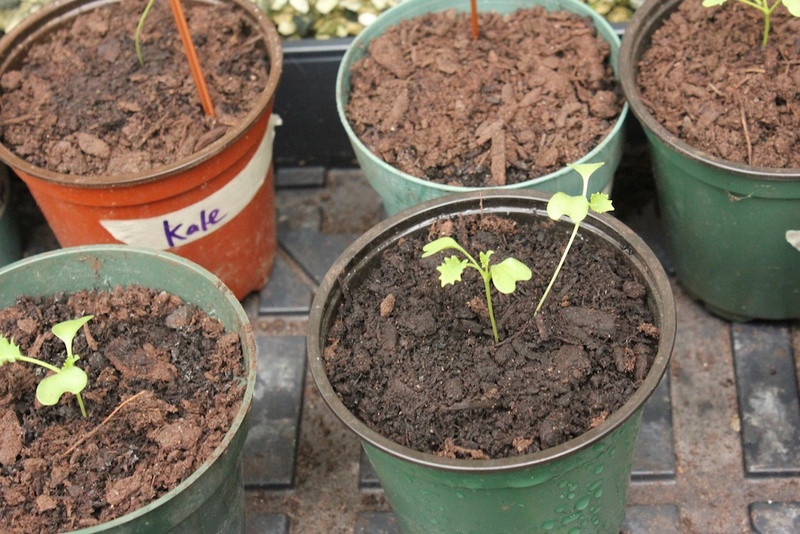 The chard and kale seedlings are however not so great. The stems are very long and thin, and they don't seem able to support themselves as their leaves grow...this is called being "leggy". I think this is because they were raised inside the school. The school's temperature is quite warm and constant, while I think kale and chard like colder and more variable temperatures. I have put the seedlings outside, and they seem to be coping with the colder temperatures so far. We'll see...if they don't survive, we'll grow some more outside from seed. Live and learn.